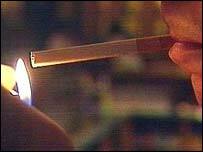 As many as 1.2 million people in England could try to stop smoking in the New Year, figures suggest. Cancer Research UK analysis of smoking trends since 2006 found January was the most popular month to stop, with an average of one in eight smokers trying. The charity also said those who tried in January tended to be more successful than those trying in other months. The NHS is launching a campaign to raise awareness of the free support methods available to help smokers stop. In the New Year a series of "Getting Off Cigarettes" adverts will highlight the range of free stop-smoking support provided by the NHS. The last available figures showed around 24% of adults in England smoked. The NHS Information Centre reported in September that more people had stopped smoking in the first three months of 2007 than in any other quarter in anticipation of the smoking ban that came into force in the summer. Professor Robert West, director of tobacco studies at the Cancer Research UK Health Behaviour Unit, calculated that 13% of smokers tried to stop in January 2007 - the equivalent of every adult in Newcastle, Manchester, Coventry and Bristol. By monitoring trends in quit rates, he also found that those who chose to quit as their New Year's resolution did better than those who quit at other times of the year. He said: "We have found that almost half of all smokers actually try to quit at least once over the course of the year and one in eight try to quit in January. "But I was particularly interested to find that, contrary to popular scepticism of New Year's Resolutions, smokers who quit in January also tended to be more successful at staying off cigarettes." He said that many people did not know about the free support that was available to them on the NHS or were put off because they did not know what the services were offering. "It's not like alcoholics anonymous, it's just practical advice," he said. "With willpower alone, the chances of success are very small. "The first thing is to get the right medication, whether that's nicotine replacement, zyban or champix, and the really important thing is having it explained exactly how to use it and to make sure you use enough of it." Contrary to the NHS Information Centre report, his figures suggest that although people intended to stop because of the smoking ban, the actual number of people smoking has not yet changed. "What we saw in Ireland was it took a few months for the effects to take hold."